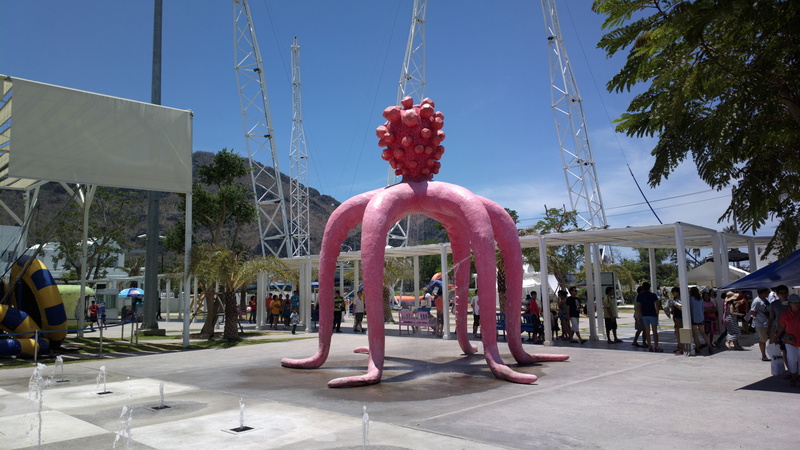 All photographs taken on these pages were taken with either the Nokia N8 or the Nokia 808 Pureview. While they may not be as good as some DSLR cameras, they take extremely good photos for a “camera you’ll always have with you”. 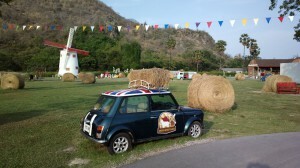 Cha Am is about 25 km north of Hua Hin. The town is smaller than Hua Hin and not as developed. 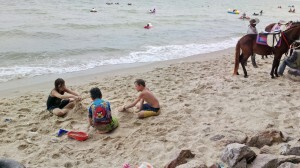 While visitors to Hua Hin tend to be foreign or urban Thai, visitors to Cha Am are younger Thais or those with new families. There are many hotels and guesthouses but not many of the international standard as in Hua Hin. 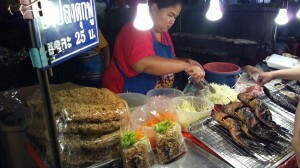 Food in Cha Am is plentiful and inexpensive. There are no international fast food chains there, as yet. 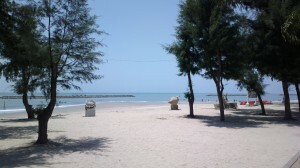 The Cha Am beach is long and lined with Casuarina pines. 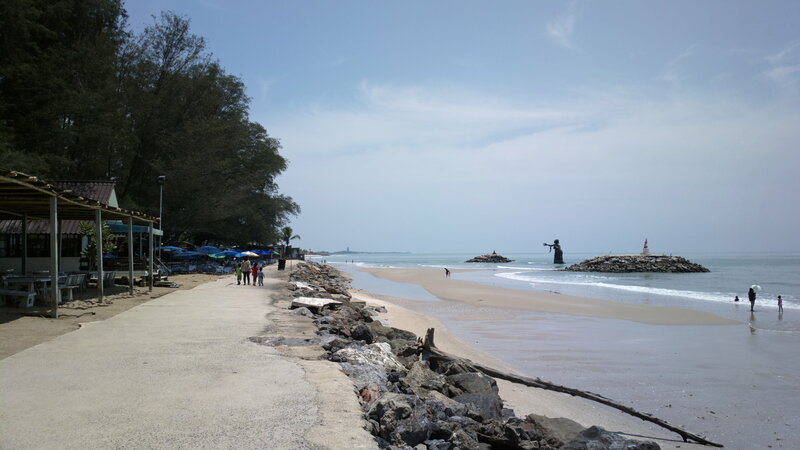 The beach has suffered from soil erosion in spots over the past 30 or so years so sections of rip rap have been added along some stretches of the 5 km beach. This can make access a bit difficult in places for some, but most folks don’t have much trouble. 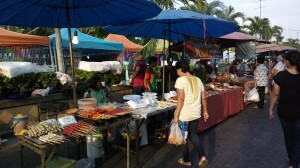 There is a very large night market in Cha Am on Wednesday evenings. Everything from fresh meat, fish, and produce are on sale as is prepared food, clothes, CDs, DVDs and toys. This is a very popular market and shops on one street set up tables you can use to eat your food for the purchase of drinks from the shops. Many older farangs may be seen at these tables having their weekly sessions. North of Cha Am are more beaches and amusement parks like the Swiss Sheep Farm and Santorini Park. 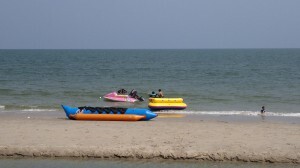 The surf is not rough and ideal for inner tubes and banana boats. Pony rides are also available. The children have lots to keep them busy while the adults eat and swap stories. 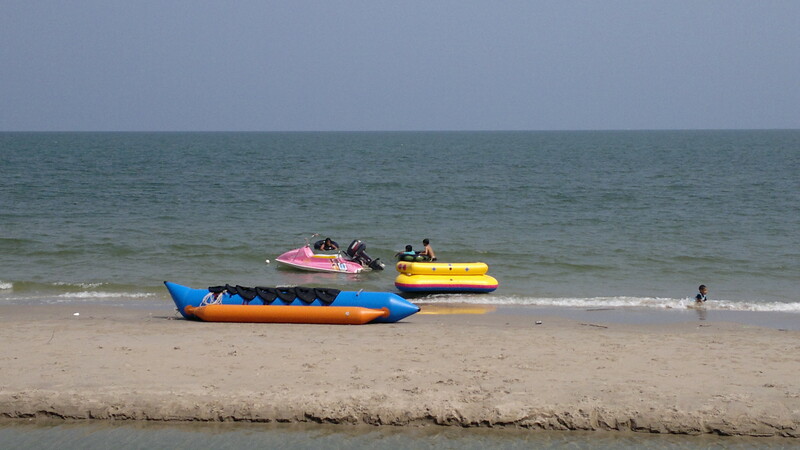 Here you can see the banana boats and children with inner tubes on the beach. 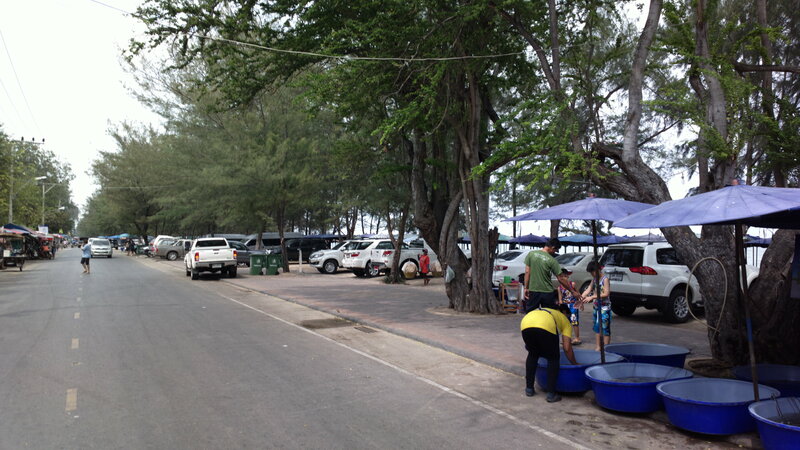 The Casuarina trees between the street and the beach provide some shade. 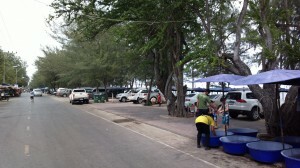 There is off-street parking along the street as most of the tourists are from Bangkok or other provinces with their cars. Along the beach locals have set up lounge chairs, tables and umbrellas. There is a usage fee, but not steep. Other folks ply the beach offering everything from toys and massages, to food and snacks. 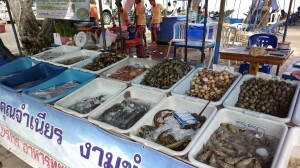 Also, there are stands such as this selling fresh seafood. Here we see mussels, horseshoe crabs, shrimp, blue crabs and a variety of fish. 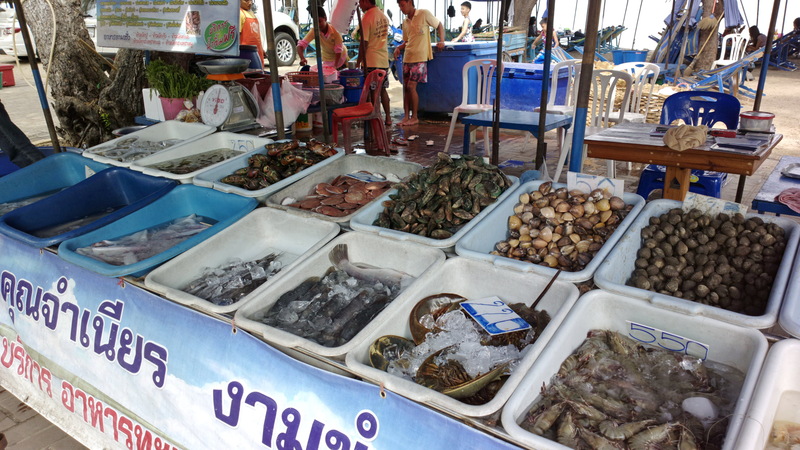 All of these may be prepared to your liking, as long has it’s Thai style or in a way that’s not too complicated for the cook. Menus, sometimes in English, are also available. Eating is very much part of the beach experience in Cha Am. 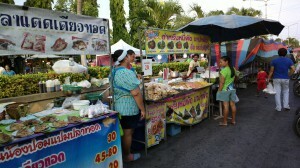 The Night Market starts setting up in the mid-afternoon on Wednesdays. These stalls are selling fried sun-dried fish and noodles. A couple of stalls down a lady is selling sushi. 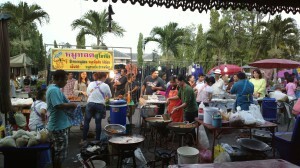 These folks have hot dogs, fish and pork balls for grilling, served with a spicy sauce. Next over is Khao Man Kai ข้าวมันไก่, or the Thai version of Hainanese chicken rice. Further down is chicken. Lots of things to munch on as you people watch. Here we’ve got fried pork, Sukothai-style, including ribs, pork belly, and sticky rice. Next over is a variety of curries, all ready to bag up and take home. The woks are busy for the hungry crowds. This is perhaps why many Farangs living in Thailand will never learn to cook Thai food. This plate filling bag of Yam Pla Duk Fu costs less than US$1 and is so much easier, and tastier, than what can be made at home. Prepared from a grilled, then fried, catfish and served with a raw papaya salad, this dish is great with a couple of ice-cold beers. For the recipe click here. The Swiss Sheep Farm is one of the latest in the build-it-and-they-will-come genre of attractions in the area. And come they do. 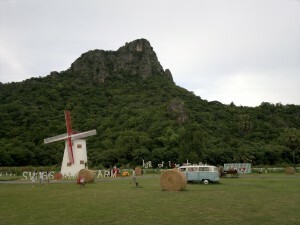 A few dozen sheep and goats to feed (a few blades of grass are included in the price of admission), pony rides, swans, and lots and lots of places to take photographs, and souvenirs to take home to the folks. It’s not Thailand; it’s not Switzerland, but it’s a place to go and something to see–like the tepees and rock shops on the endless miles of old Route 66. There are many old vehicles scattered around the property. 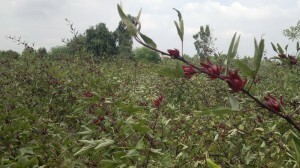 Many are in very good shape. Most are to photograph but some are there simply for the joy of climbing. Kids like it. My son likes it though he’s intimidated by the aggressive sheep. 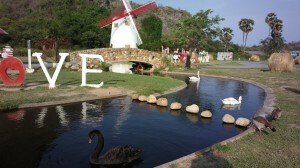 He likes the giant pumpkins and old cars to climb on, the rope swings, the swans, and the mini-carnival. 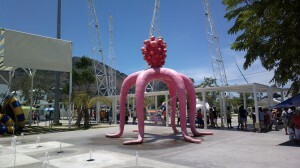 It’s kitsch but it’s also very popular. 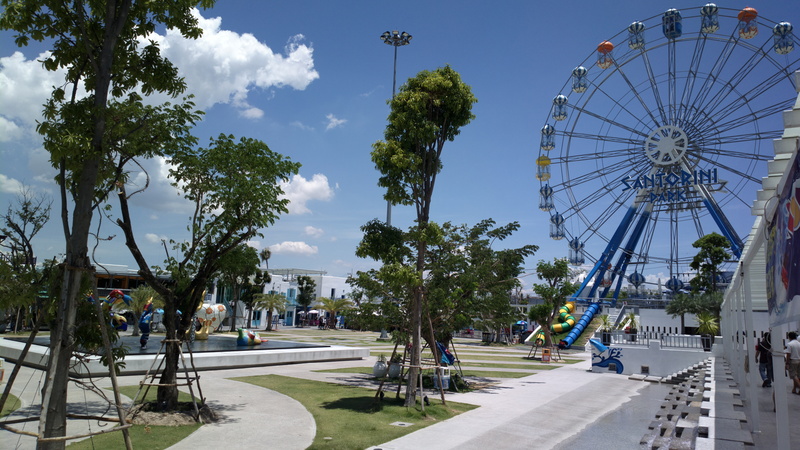 There are more Thais than Farangs there but there are many Farang families taking advantage of a place that the kids will enjoy. There’s food to eat and odd things to buy. What’s not to love? Black and white swans and ducks are quite friendly at the Sheep Farm, more so than the sheep. 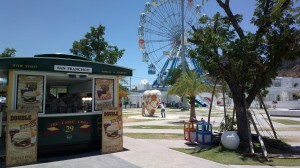 A burger stand and photo opportunities at Santorini Park. There are many small restaurants with a wide variety of foods available. 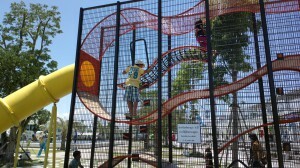 It can get incredibly warm at the park and this Hexapus mister comes in handy for those wanting to cool off a bit. There is a serious lack of shade at the park. It will be a few years before these trees do much good. This climbing cage even has rubber stepping stones on the outside for children to climb on. 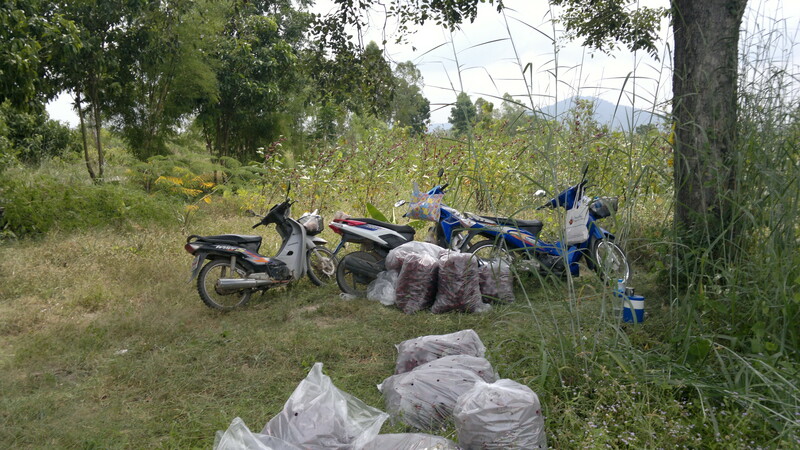 Puek Tian is about 19km north of Cha Am on Hwy 4028/4033. 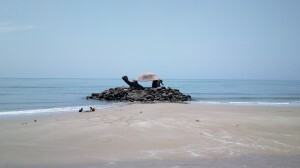 This beach is known for its statues of characters from the Thai literary classic Phra Abhai Mani by poet Sunthorn Phu. 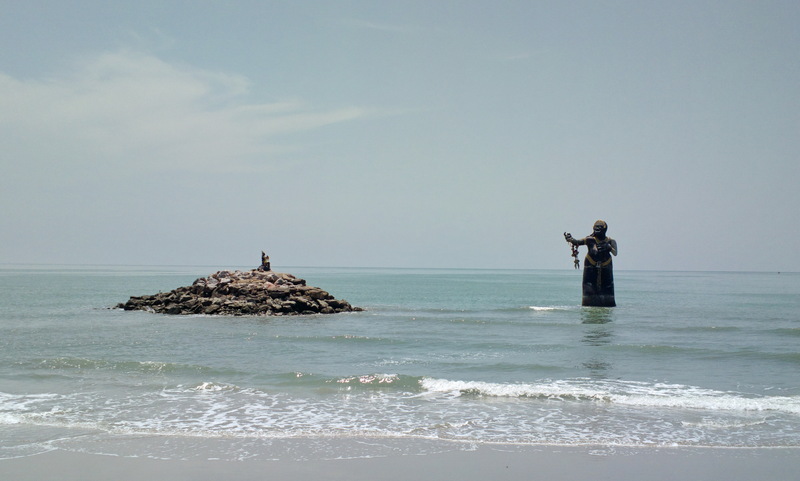 This is a statue of Pisua Samudr the Giantess. At low tide you can walk to the statute and island. There are a few seafood restaurants along the beach and some basic bungalows for rent. 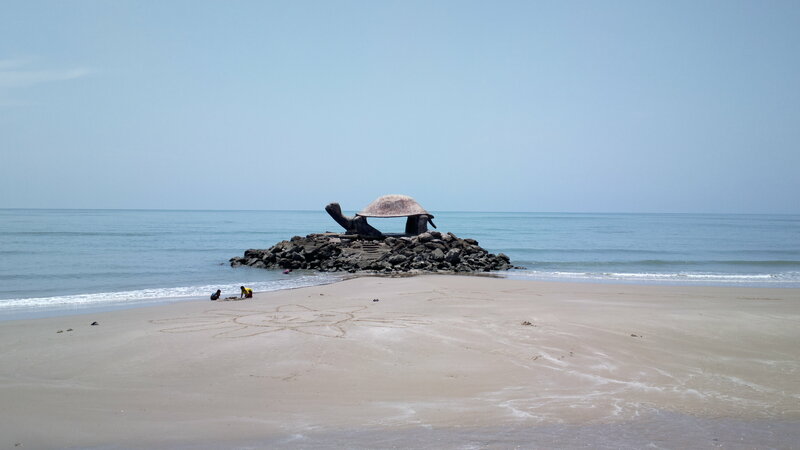 At low tide the beach is fine for children but at high the surf hits the rocks. 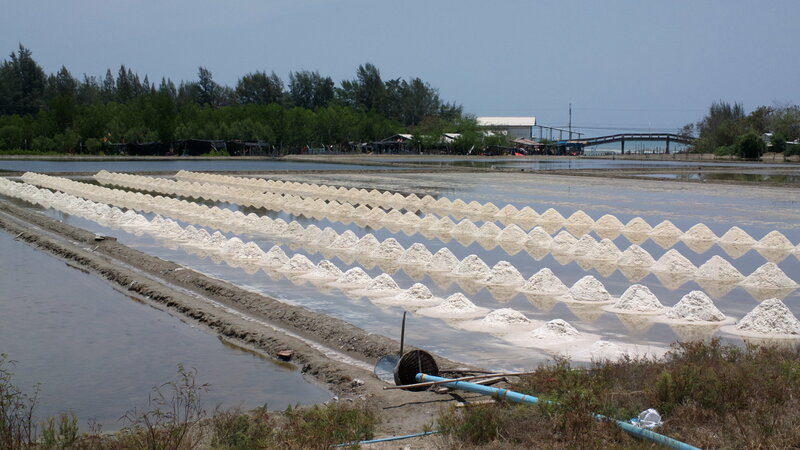 Salt farm on the way to Chao Samran Beach, north of Puek Tian. 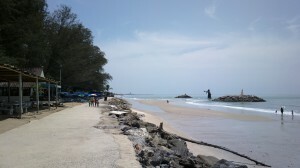 Chao Samran Beach is one the nearest beaches to Petchburi town. Still in Cha Am district but several km inland, one may find roselle, or กระเจี๊ยบ. Here it is interplanted with pineapple. 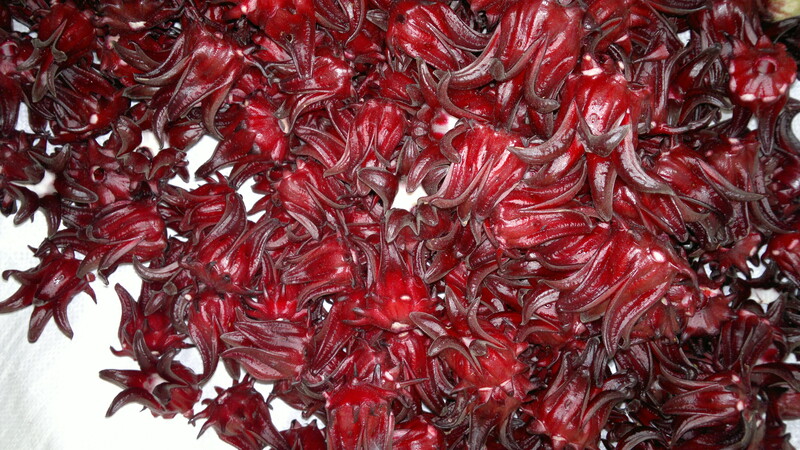 Roselle (Hibiscus sabdariffa) is used to produce a cool drink but is also served as a tea. Here the young flowers have been harvested and are on their way to a wholesaler. 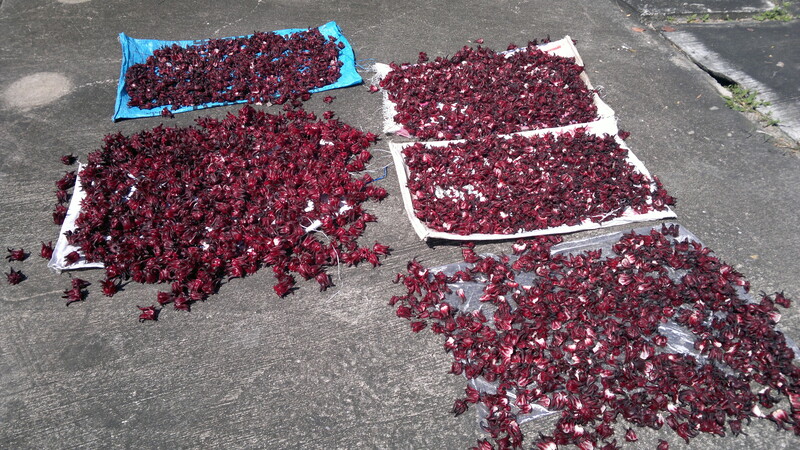 The seed capsule is removed and the flowers are allowed to dry in the sun. 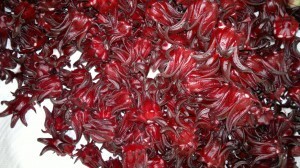 Once dried, they are seeped in warm water, usually mixed with sugar. The deep red drink is then most often served over ice. Not as common as it was before the introduction of soft drinks, ladies with the large jars holding the drinks are still found in markets and around schools in the afternoon.